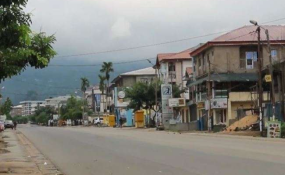 The deserted streets of Buea, where protests demanding independence for Anglophone regions has brought life to a standstill. Cape Town — For a long time the country has been divided along tribal lines. This ethno-fascism reached its peak when the minister delegate at the ministry of justice, Jean De Dieu Momo, warned the Bamelike people (from the western province of Cameroon) could be exterminated like Adolph Hitler did with the Jews. The country's Minister of Communications, René Sadi, in a half-hearted apology distanced the government from the minister. He said the minister was talking in his capacity as his political party leader, and not as a government official. Momo later apologized to Israel saying he was misunderstood and his utterances were taken out of context. Although an apology was offered to the Israeli embassy, Cameroonians are up in arms. They say the apology was simply meant to avoid a diplomatic spat between the two countries. Both ministers failed to apologize to the Bamelike people, and by doing so brought back memories of the massacres during the struggle for independence in the 1960s. In addition, Cameroon is at a crossroads, with a government that seems to have lost touch with the masses, an economy on the brink of collapse, corruption rife and the country is a ticking time bomb. The Anglophone crisis has brought the two English-Speaking parts of the country to a standstill, while Boko Haram terrorists have paralyzed the northern part of the country and rebels from neighbouring Central African Republic are causing havoc in the Eastern region. Further polarization of the country through ethnic division could prove disastrous. For many Cameroonians, this divide and conquer system has proved effective for the government. They say every time the government finds its back up against the ropes, it uses tribalism to turn citizens against each other. Cameroon has over 250 ethnic groups and the possibility of the country exploding, if such notions are not brought under control, is real.